Pest description and damage This scale insect's covering is a small (0.0125 inch) oval shell, light brown to tan in color. The adult female is lemon yellow. 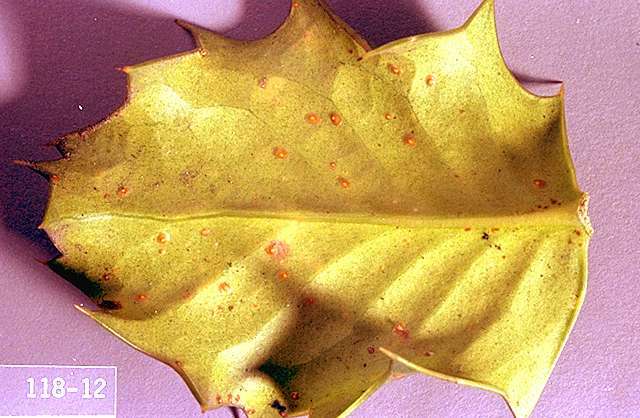 Scale feeding can cause the upper surface of the leaves to become mottled and plant defoliation may occur. Heavily infested plants can be coated with honeydew on which black sooty mold develops. Heavy infestations can weaken plants and make the holly useless as holiday greens. Biology and life cycle This insect overwinters as an immature scale. In spring, the nymphs mature and begin feeding in late March or early April. The adult males emerge from under the scale and fly to find the adult females in May. Eggs are laid in early- to mid-summer. Around 2 weeks later the eggs hatch and begin to disperse to foliage throughout the tree. There is only one generation per year.